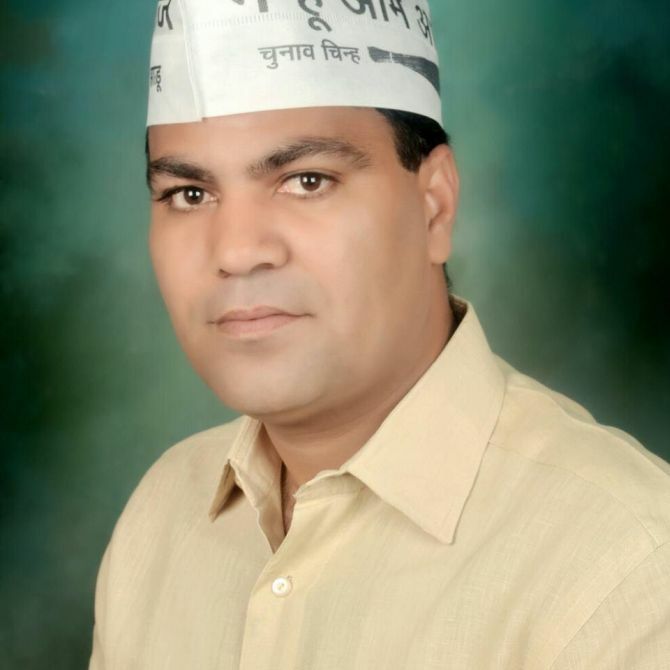 Aam Aadmi Party MLA and Gujarat affairs in-charge Gulab Singh on Sunday surrendered before Surat Police and was arrested by Delhi Police after a non-bailable warrant was issued against him in connection with an extortion case. Singh’s arrest has come hours ahead of Delhi Chief Minister and AAP national convener Arvind Kejriwal’s public rally in the city. “Delhi Police had come here with a non-bailable warrant against Gulab Singh. He learnt about it before hand and came to Urma police station where we handed him over to Delhi Police,” Surat Police Commissioner Satish Sharma said. The Delhi Police will take Yadav to a court to secure a transit remand. “I am in Gujarat since September 6 and I was here when the FIR was filed on September 13. Police raided my office and got nothing incriminating. The Centre is directing arrest of AAP MLAs but we are not going to bow and are ready for any consequences,” he alleged. Last month, two property dealers, Deepak Sharma and Rinku Diwan, had alleged that Satish and Devinder, who work in Yadav’s office, and an associate Jagdish, were extorting money from them by threatening to get demolished the building from where they were operating. A case under Section 384 (punishment for extortion) of the Indian Penal Code was registered at Bindapur police station on September 13. Meanwhile, Kejriwal, who is on a four-day visit to Gujarat, alleged while talking to reporters in Vadodara before leaving for Surat that Bharatiya Janata Party president Amit Shah was trying to affect the rally. “I appeal to Amit Shah ji that this is not my rally but that of the public ... You see 13 MLAs have been arrested by Delhi Police on the direction from the BJP,” he said. The non-bailable warrant was issued against Singh, who is MLA from Delhi’s Matiala, on October 14 for allegedly not joining probe in the case. Delhi minister Kapil Mishra, who is attending the AAP rally in Surat, said Singh's arrest was a turning point in Gujrat politics. ‘Gulab singh arrested hours before historical rally in Surat,’ he tweeted. ‘This was done to prevent Gulab Singh from reaching the rally. The politics of Gujrat will change for ever from today,’ he said in a note posted on Twitter. Singh’s alleged associates Satish, Devinder and Jagdish were arrested and a probe was taken up in the matter which revealed that the ‘organised extortion racket’ had been operating with the knowledge of the MLA, police claimed. Following the investigation, Singh was named in the FIR and issued notices to join the investigation but he did not turn up for questioning, they said. The Delhi Police team was in Gujarat looking to arrest the MLA but he was ‘running away’, he said. “Our team was in Surat for two days. He was running away and hiding. He was served several notices but he avoided investigation on one or other pretext,” he alleged. The NBW was issued against Singh, who is MLA from Delhi’s Matiala, on October 14 for allegedly not joining probe in the case. “The MLA has been arrested under charge of running an extortion racket. There were concrete evidences against him for his arrest,” the officer said. “One of the arrested men worked at office of the MLA. His driver who was driving his personal car with sticker of the legislator was arrested later on the night of September 13 in connection with the extortion,” he said. The officer said that investigation and statements by the arrested accused have revealed that it was an ‘organised extortion syndicate’ with ‘links’ to Singh. “Investigation so far reveals that he was Sutradhar (kingpin) of the entire exercise of extortion and its management,” he said.